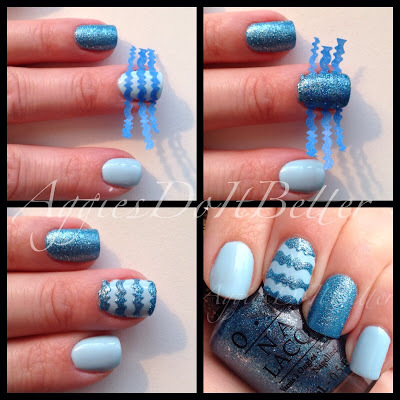 Aggies Do It Better: Decorative Stripes Nail Art plus tutorial! Hey guys! 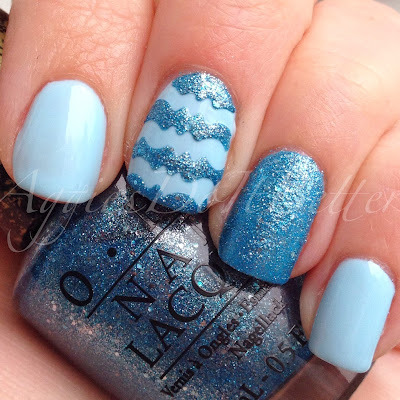 These are my "pastel blue" nails for the #nailartjan challenge going on on Instagram. I mean, a very high percentage of the polishes I own are blue sooooo........ easily a favorite for me! I am on a serious tape mani kick now, obviously! Here is a quick tutorial on how to do this! This is my first official tutorial, let me know what you think! I am going to try to keep them simple! I think pictoral collages like this are very helpful. First up: I started with 2 thin coats of my "blue" OPI Gargantuan Green Grape. I use it alot! Then clean up the edges..this is what I'm currently using to clean up. The brush is an old one from a makeup brush kit from Target...I need a new one! While the polish is drying, I cut strips out of painters tape with some craft scissors. Look at me not using Chevron! Then I added a 3rd coat of GGG to all nails except my ring finger, I used OPI Tiffany Case. I used this over the other polish instead of on its own, because I've heard it stains. I'll update this when I take it off to let yall know if it helped! Top all but the textured nail in topcoat. Then, later, MUCH later, (I like to wait several hours) place your tape strips on the nail. Quickly paint over with Tiffany Case and then remove the strips. Carefully but QUICKLY! You want to take them off before the polish dries. And Liquid Sand dries fast! There you go! What do you think? I am loving this look!